More than half of household garbage going to landfills in Fort Collins is organic material that could be composted, rather than disposed. About half of that is food waste! Composting can save you money on your trash bill and reduces greenhouse gas emissions. Compost is highly valuable to help your soil retain water and nutrients better — meaning you can irrigate and fertilize less in areas treated with compost and your plants will thrive! Backyard Composting by CSU soil sciences professor Addy Elliot. The Art and Science of Composting by CSU soil sciences instructor Natalie Yoder. To make traditional compost, alternate different types of shredded plant materials in 6 to 8 inch layers. Layering helps compost reach the correct nitrogen balance. It’s important to add both “brown” and “green” items to your overall compost mix. “Green” items are high in nitrogen and typically include fresh cut grass, fruits, vegetables, coffee grounds and plants. “Brown” items are high in carbon and are dry, such as dead plant material. Try to use 2 parts brown material to 1 part green in the overall mix. Traditional composting also includes soil as one of the layers. While soil can serve as a source of microbes to "inoculate" plant wastes, research has found that the microorganisms that break down plants also are present on the surface of the leaves and stems. It's natural for some soil to cling to pulled weeds and uprooted vegetable and flower plants. When you add large amounts of soil you increase the weight, which makes composting difficult and less efficient. Large amounts of soil also can suffocate microorganisms. 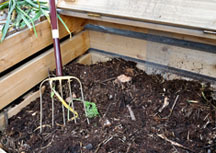 "Soilless" composting is often practiced. Add water to the compost after every few layers of material. If the plant materials are dry and no green material is available, add a small quantity of blood meal or a commercial nitrogen fertilizer free of weed killers. One-half cup of ammonium sulfate per bushel of material is sufficient. Livestock manure also can be added and supplies some nitrogen, but its use is optional. Like soil, manure adds weight and bulk. The space devoted to manure could alternatively be used to compost yard wastes. There is no advantage in adding compost starters or inoculum to the compost. The microbes that cause decomposition multiply as rapidly from those that are naturally found on the plant waste. The breakdown of organic yard wastes is a biological process dependent on microorganism activity. Like most living things, these microbes require favorable temperatures, moisture, oxygen, and nutrients. Plant-digesting microbes operate in a temperature range of 70 degrees F to 140 degrees F, but breakdown occurs very slowly at the lower temperatures. Well-managed compost rapidly breaks down in summer when compost temperatures quickly reach 120 degrees to 130 degrees F. If summer heat plus the heat produced by active microorganisms causes the temperature of the plant mass to exceed 160 degrees F, the microbes will die. Colorado winter temperatures cool compost and greatly extend the time required to produce a finished product. Moisture and oxygen are essential to microbial activity. In a region of limited rainfall such as Colorado, add moisture regularly to maintain composting. If parts of the composting material dry out, many microorganisms in the dry areas die. The microbes that remain require time to multiply and resume plant digestion even when moisture is added. The net result is slower composting. However, excess moisture displaces air and slows breakdown. Surplus water creates low oxygen conditions where certain microbes multiply and produce foul odors. The best description of the proper moisture level is “moist” or “damp” but not soggy. The entire mass of plant wastes should be moistened uniformly to the point where only a few drops of water can be squeezed from a fistful of plant material. The size of plant particles that go into the compost also affects aeration. Large particles allow a lot of air to circulate around the plant chunks, but breakdown is slow because microbes can act only on the outside, not on the inside of the large chunks. Particles chopped into smaller chunks increase the surface area for microbes to operate but particles chopped too small will compact and restrict air flow. Moderate-sized plant pieces of ½ to 1½ inches are the best size to use and can be produced by hand or machine shredding. Woody materials need to be chopped into a smaller size. Leave soft plant parts in larger pieces for effective composting. Fluff or turn the material with a pitchfork or aerator tool at regular intervals to provide additional aeration and distribute microbes throughout the compost. The microbes that break down plants use the plants for food. Nitrogen is the most important food nutrient because a nitrogen shortage drastically slows the composting process. Woody and dried plant materials tend to contain little nitrogen in comparison to the total mass of the material. Green plant material, however, contains a high percentage of nitrogen. A mix of equal parts green and dry plant material generally gives the best nitrogen balance. Add a plant fertilizer high in nitrogen when green materials are scarce. A variety of materials can be composted, but most gardeners want to recycle collected yard waste. Plants lose between 50 percent and 75 percent volume in composting, so a lot of plant material can be processed effectively. Composting can be effective on most yard wastes such as leaves, vegetable and flower plant parts, straw, and a limited amount of woody pruning, grass clippings and weeds. Woody twigs and branches that are greater than 1/4 inch in diameter should first be put through a shredder-chipper. Avoid highly resinous wood and leaf prunings from plants such as junipers, pine, spruce and arborvitae. The resins protect these materials from decomposition and extend the time needed for composting in comparison with other plant materials. High tannin-containing leaves (oak and cottonwood) have similar problems but can be used if chopped well in small quantities and mixed with other materials. The easiest way to handle grass clippings is to leave them on the lawn. Research results show they return valuable nutrients back to the soil. Some grass clippings can be used for compost if other green plant material isn't available. In general, catching and bagging grass clippings is not worth the effort when they can be easily recycled right on the lawn. If clippings are too long to leave on a lawn, composting is a better alternative than disposal in the trash. Some weeds can be composted, particularly if they are pulled before they produce seed. Many, but not all plant disease organisms, are killed if the compost reaches 122 degrees F. Temperatures will vary throughout the compost. Outer layers stay cooler than the center and cause uneven kill of disease organisms. If a plant is severely diseased, it is better to dispose of it in the trash. In general, avoid plants treated with weed killers. Small amounts of herbicide-treated plants may be mixed in the pile as long as you are careful to allow for thorough decomposition. Weed killers and other pesticides break down at various rates. If you use treated grass clippings, the breakdown of these chemicals should be at least as fast as breakdown in the soil. Plants killed with weed killers that are soil inactive (glyphosate products such as Roundup or Kleenup) should present no problem when composted in small quantities. In addition to yard wastes, many people compost kitchen wastes such as vegetable scraps, coffee grounds and eggshells. These materials add to compost but should not displace yard wastes. Animal wastes (meat, bones, grease, whole eggs and dairy products) may cause odors and attract rodents and are not recommended. Human, cat or dog feces may transmit diseases and should not be used in compost. Some animal products that can be used as organic sources of nitrogen include blood and steamed bone meal, and livestock manures from plant-eating animals (cows, sheep, rabbits and chickens). Compost mainly serves to reduce the volume of yard wastes and convert plant materials into a useable soil amendment. Adding excessive amounts of other materials, such as animal manures, defeats the purpose. Black and white newsprint or cardboard is best recycled rather than converted to compost. If paper is composted due to a shortage of dry materials, add no more than 10 percent of the total weight of material being composted. Do not use wood ashes or lime for composting in Colorado. Both increase salt and alkalinity that leads to a loss of nitrogen in the form of ammonia gas. Choose a composting site carefully. Partial shade avoids the baking and drying in summer but provides some solar heat to start the composting action. A site protected from drying winds prevents too much moisture loss. Another consideration is the convenience of moving volumes of plant materials in and out of the area. Choose a site close to where the material will be used, but not highly visible or one that interferes with yard activities. It is also practical to choose a location in proximity to a garden hose or spigot that allows you to maintain good moisture content. Structures aren't necessary for composting but prevent wind and marauding animals from carrying away plant wastes. Open compost piles can be used in less-populated rural locales but structures are a near-must in urban areas. Many useful structures for composting can be purchased or built. These structures vary in how well they can be managed to meet the requirements for effective decomposition under Colorado environmental conditions. Many people cover their compost with an old piece of carpeting or plastic to prevent the outer layers from drying too much. Such covers need to be removed periodically to add more water and plant material and to aerate the mass. A minimum volume of material is necessary to build up the heat necessary for efficient composting. This volume is generally around 36 inches by 36 inches by 36 inches, but well-insulated wood or plastic structures can be smaller and still hold enough heat to compost well. Wastes should heat up within two days if the compost is put together correctly. Structures built of wire may have drying problems. This depends on how many sides of the structure are exposed and whether the exposure is on the windward side. Plastic covers or old carpeting often must be used with wire bins. Wood structures do not dry as much but are generally more expensive to purchase or construct. An efficient wood structure is the “three-chambered bin” system that allows plant material to be aerated by turning from one bin to the next as it decomposes. Compact plastic composters are available through garden centers and catalogs. They work well for small yards that produce few plant wastes. Some of these use a vertical composting system where fresh materials are added to the top and finished compost is removed from a drawer in the bottom. This system requires an aeration tool to reach in and stir plant materials on a regular basis. If you use metal barrels for composting, drill holes to allow air to enter. Turn the barrel on its side and roll it to mix and aerate the compost. There are many structures useful for composting; no one structure is best for all people. Choose one that is easy to manage and can hold the amount of plant material generated by your yard. Soil amendments must be mixed well with the soil to separate clay particles or hold water in sand. For this reason, prepare soil before planting lawns or trees. Areas planted every year such as vegetable or annual flower gardens can accept frequent applications of compost. Indoor potted plants and outdoor container plants benefit from the use of compost as an ingredient in potting soils. As with peat-based mixes, potting soils that use compost require a material such as perlite to avoid waterlogging. Some weed seeds can survive composting but weed plants can be easily pulled when they appear. Compost has bad odor. Lack of air. Turn or use a tool to aerate it. The center of the mass is dry. Lack of water or failure to moisten materials while stirring or turning Regularly water the pile. The outside couple of inches are dry. Dry Colorado air. Water regularly or cover with a plastic sheet or tarp. The center is damp and warm. Outside is cool and somewhat dry. Too small a plant mass overall. Collect more plant materials and mix with the old to form a new mass. Plant wastes are damp and sweet smelling but mass will not heat up. Lack of nitrogen. Mix in a nitrogen source such as fresh grass clippings, granular fertilizer, bloodmeal, manure.